I love Rice Krispie Treats. It’s the kind of love where you can eat at least half of a bowl of the warm butter, marshmallow and cereal mixture before even putting it into the pan and not getting that sick oh-I-ate-too-much-sugar stomachache. And then never actually putting any into a pan in the end. That’s what Emma and I did one day at the beach. And it was the best half-hour ever. Often best straight from the bowl. It had been a rough day up to that point: sleeping in late, trying to decide what to do, slathering up with sunscreen, walking down to what we call “Adventure Beach,” and leisurely walking among the sand and shells. Our annual week at the Eastern Shore is always at this pace, and it’s the one time all year that we don’t have to feel guilty about doing anything. My only goals? Get a tan and make my hair blonder, both accomplished (with some sunburn though). So, after we got back from our adventure with my dad, aunt and uncle, we decided that it was time for Rice Krispie Treats. We had already made brownies earlier in the week with our cousin, as well as my favorite chocolate banana milkshakes that I had been craving for weeks in Ireland, but we still had the ingredients left for this five-minute dessert. 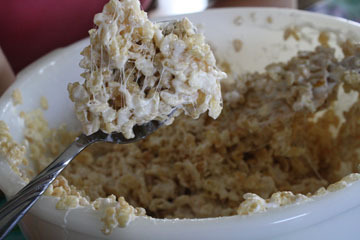 Easiest sweet ever: melt together butter and marshmallows in the microwave or on the stovetop, add the krispies, and voila! Pure happiness. We plopped the bowl down onto the table, and stuck the spoons in. Rice Krispie Treats aren’t too sweet (though you do want some water afterward) or too rich, though I don’t want to think about how they’re basically pure sugar. Emma described them as “ooey gooey deliciousness.” As we sat munching our way through the bowl, we barely talked except to say how happy we were and how they were the best invention ever. Eventually though, our stomachs did tell us that they were full and that we should go sit in the sun some more, but no worries, my uncle polished off the bowl for us later that night.